The US and China agreed to step back from the brink of the trade conflict, at least for 90 days. 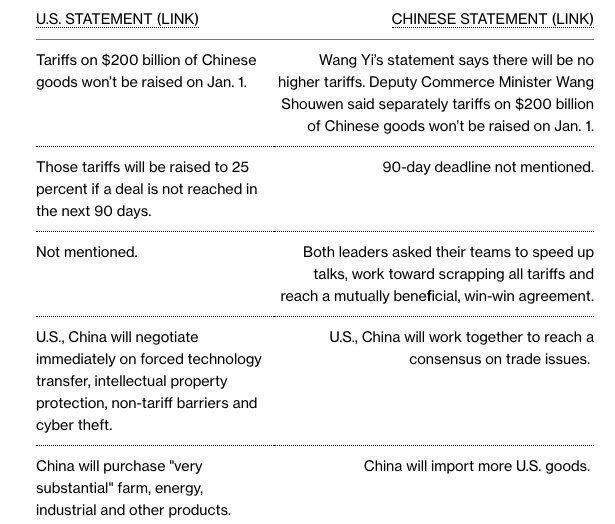 President Trump told Xi Jinping that he will not add any new tariffs or increase the rate on existing ones while the US and China spend the next 90 days trying to work out a more lasting deal. Conveniently that timeline gets both sides through key holidays—Christmas in America and the Lunar New Year in China. It also means the deadline hits right as the 2020 US Presidential election starts gearing up. Markets so far seem pleased at the outcome, though there is little to indicate any of the structural, contentious issues in trade (such as IPR protection, forced technology transfers, State-owned enterprises) or just about every other dimension have a better chance of being resolved now than they did before the meeting. I did not see anything announced from the US side about human rights, Xinjiang, or the three American citizen family members of Liu Changming who are not allowed to leave the PRC. At first glance the outcome looks like a win for Xi Jinping and China. The Chinese are always playing for time and any pause that involves more talking is a victory for Beijing, as it only adds to the chances they have for a shift to a more favorable US domestic political environment and, as we have learned with the waning “maximum pressure” campaign on North Korea, once you step back from the brink it is difficult to marshal the support to return to it if the talks do not bear fruit. Which begs the question: has President Trump, who has pushed the Chinese on trade harder than any recent US President, failed to maximize the leverage his administration policies created? China will agree to purchase a not yet agreed upon, but very substantial, amount of agricultural, energy, industrial, and other product from the United States to reduce the trade imbalance between our two countries. China has agreed to start purchasing agricultural product from our farmers immediately. Any resumption of bulk buying of US agricultural goods would be welcomed by US farmers who looking at rotting crops and massive losses. The Sunday CCTV Evening News has a report (习近平同美国总统举行会晤) on the meeting. It is the second report, after one on Xi’s attendance at the G-20. The CCTV report does not include specific mentions of purchases of US goods or the 90 day timeline, but it does note Trump’s comment that America welcomes PRC students and Xi’s commitment to do more to crackdown on Fentanyl production and export. Does that mean that Alibaba will come under pressure to remove all listings for fentanyl and its related compounds? Xinhua says that Xi, Trump hold 'very successful' meeting on ties, trade. If you have a company with significant supply chain exposure to China you should continue to be making plans to reduce reliance on China. 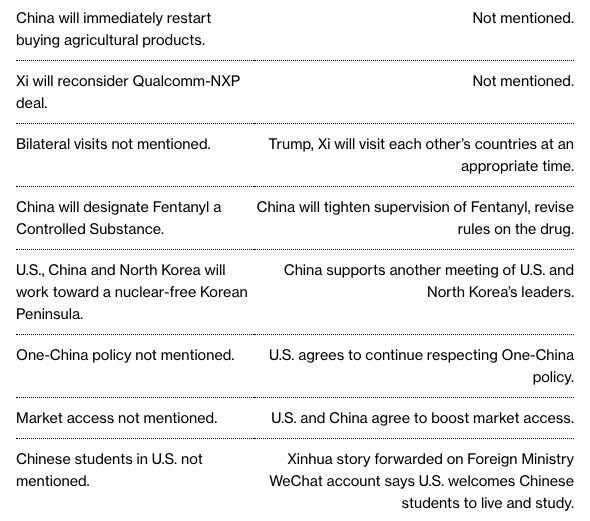 Maybe we really have walked back from the brink, but I doubt it and am still very skeptical that the US and China can solve the underlying structural issues in the next several years, let alone 90 days. In December China will hold the annual Central Economic Work Conference, possibly a Fourth Plenum, and likely a big speech from Xi for the 40th anniversary of the 3rd Plenum held from December 18 -22 that year, the meeting that marked the start of the Reform and Opening Era. 1. Trump’s “leading authority on China” Michael Pillsbury is the subject of Politico and New York Times profiles this weekend. It seems quite the coincidence that they would both run similar stories right before the big Trump-Xi meeting. That outsider was Michael Pillsbury, a starchy academic at Washington’s conservative Hudson Institute enjoying a remarkable, and unlikely, influence. He has caught the ear of Trump, who during a November press conference proclaimed him “probably the leading authority on China.”.. The community members providing the tip off were apparently from a “community group,” or qunzhong zuzhi (群众组织) known as the “Old Neighbours of Shijingshan” (石景山老街坊). In Beijing, this is one of a number of fairly well-known and well-documented community groups. Others include the likes of the “Chaoyang Masses” (朝阳群众), the “Haiding Internet Users” (海淀网友), the “Xicheng Aunties” (西城大妈) and the “Fengtai Advising Squad” (丰台劝导队). These groups point to an emerging, and already quite developed, new model of community management in China that is being linked quite explicitly to a Mao-era experiment in social management known as the “Fengqiao experience,” or fengqiao jingyan (枫桥经验) — an experiment President Xi Jinping has voiced enthusiastic support for since he was the top leader of Zhejiang province 15 years ago, and which now seems to be a core idea for social and public security management in the Xi Era. 3. The first issue of China Leadership Monitor under the leadership of Minxin Pei is now live. Barring really big news the next issue of the newsletter will be on Tuesday. Not a subscriber? Fix that by signing up today. Said it before..obsession with the stock market will be the undoing of America, not Chicom.